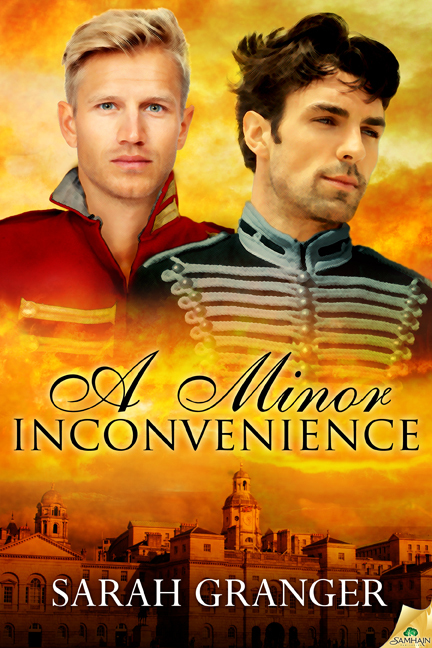 I am over the moon today to have my very first guest here at the website, and for it to be author Sarah Granger, who has just released the most wonderful Regency m/m romance, A Minor Inconvenience. I confess that I grew up reading Georgette Heyer and love her ability to create and make real a world that’s very different to our own. Sarah, too, has this ability in spades. As I remarked in my review of the novel: The writing is beautiful, some of the wry, clever speeches laugh-out-loud funny, and throughout the whole there is such a sense of time and place that you forget that this mundane world of ours isn’t one of breeches and Almacks, Vauxhall gardens and opera dancers. Sadly. Thanks so much to Anna for hosting me. I’m a fan of her blog as well as her fiction, and am chuffed to bits to be here to explain just how Swedish Massage crept into my newly released Regency romance. In A Minor Inconvenience, Colonel Theo Lindsay displays rather impressive massage skills for a Rifles officer. I realised when writing the book that Hugh Fanshawe, who suffers from a permanent and painful limp, would benefit from massage, but I was also aware I knew nothing about how widespread knowledge of massage techniques might be in Regency England. Several rewarding if distracting hours later (my research of course involved looking at many pictures of oiled, muscular bodies being massaged), I had part of my answer—in the first decade of the nineteenth century, a Swedish gentleman, Per Henrik Ling, had formalised a series of exercises and massage techniques into a system he called medical gymnastics. This was designed to ease joint injuries and muscle pain—precisely what Hugh required! My next challenge was to find out if Theo could plausibly have encountered anyone familiar with medical gymnastics. When I discovered his regiment spent two months in Gothenberg in 1808, the answer was clear—of course Theo would have gone adventuring during that time and met a number of Swedish gentlemen, all of whom were undoubtedly skilled in manipulating the human body. Hugh, typically, decided the entire subject of medical gymnastics was fascinating and ended up being one of the very first applicants to Ling’s newly established Institute for the Training of Gymnastic Instructors in Stockholm. History doesn’t record precisely what Hugh did with his new found skills, but I’m fairly certain that Theo’s willingness to allow Hugh to practice on him was not entirely selfless. Throwing pride to the wind, Hugh took Theo’s offered arm on the slow, painful journey to his bedchamber. Theo swiftly undressed him, but it was very different from the previous night—this time his concentration appeared to be on how best to remove Hugh’s clothes rather than what lay beneath them. He instructed Hugh to lie upon his front on the bed while he lit the newly laid fire. “Did you indeed?” Hugh muttered into the counterpane beneath him. If he sounded sulky, that was because his leg hurt like blazes and not because of the existence of an accommodating young Swedish gentleman. A Minor Inconvenience is published by Samhain Publishing and is currently available with a 30% new release discount. Thank you both! I hope you enjoy it, Sarah. I love this story and hope there is more to come for Hugh and Theo 😉 Historicals are tops on my list and it’s always wonderful to find one that is so well written and engaging. Kudos to Sarah! When it comes to hoping for a sequel, it’s you and me both! I’ve told Sarah I hope there’s more to come on those two. They make a great couple. Thank you both, so much, for your kind words! I was sad to leave Hugh and Theo behind and would love to think more of their adventures might follow one day.